NEW YORK—New York City has more waterfront real estate than any other city in the United States, and the allure of these 500-plus miles is undeniable, evidenced by the success of waterfront parks and developments. Former Mayor Michael Bloomberg has been credited with rediscovering the city’s waterfronts. He pushed previously industrial spaces to become economic drivers. The interest widened with recovery projects brought on by Sandy. But the ideas don’t just stop at the water’s edge. Architects have been proposing ideas not just to transform the city’s waterfront, but the waterways themselves. Archie Coates, Dong Ping Wong, and Jeffrey Franklin are committed to making the dream of swimming in the river a reality, and this month, they start testing the murky waters. What started as the simple desire to jump into the river and take a swim on a hot day quickly took root as an idea to build a giant, floating swimming pool called +POOL. The trio are regularly on the water, taking frequent trips to the Far Rockaways and Long Beach to surf, but the rivers just aren’t clean enough to swim in. About 76 gallons of sewage is expelled into the Hudson River every day. +POOL wanted a clean space in the river for its floating, plus-shaped pool. People are always surprised to learn that the project of creating a pool in the river is essentially “dropping a large-scale Brita filter that’s filtering out all this poop,” Wong said. “The reactions are funny, but what’s kind of cool is that people are 100 percent for swimming in the river,” said Wong. The group has already gone through two successful rounds of funding, receiving financial support from around 5,000 individuals. Samples have been taken from the East River and Hudson River to test the filtration device in a lab. This month, it is deploying a floating lab to take into account the open environment and tide in addition to water quality. +POOL has been in the works for four years and the team is in the final stage of perfecting the filtration, and getting the water clean enough to swim in. “Every step of the way, we’ve made bigger strides than we could ever imagine year by year,” said Coates. Coates, Wong, and Franklin have met with every city agency that could possibly be involved, as well as engineering and architecture experts. The response has been one of resounding awe. Development in the city has a notoriously complicated and lengthy process, even more so when the project is not quite here or there. The proposed pool is public space that’s not really a park, not the standard development, and the first of its kind. Officials at the city’s numerous agencies were initially skeptical, they said, but after making sure there are no glaring violations, an official’s reaction often changes to one of personal interest. They absolutely want to see it happen. 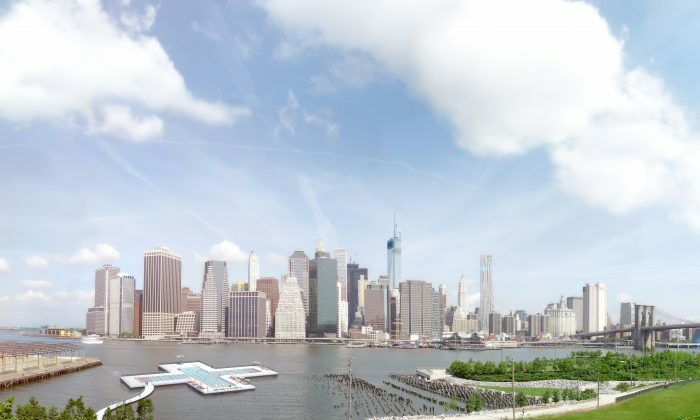 The team has done tests in the Hudson River on Pier 40 and are eyeing the Brooklyn Bridge Park as a site as well. The project has been inspiringly welcome by the local organizations they’ve spoken to, and council members have shown interest as well. “Everybody wants the first pool to be in their neighborhood,” Coates said of the conversations with council members. The drive of Coates, Wong, and Franklin has inspired the numerous organizations lending a hand, including Arup, IDEO, and Columbia University researchers. “Yes, of course it will happen. But we need to get behind it. We all need to get behind it,” Arup’s principal Craig Corvil says in a +POOL introductory video. Once the pool is constructed, Coates said, it makes it easier to create a second one. The pool, in the shape of a plus sign, is really four different pools that connect into one big, floating structure. There’s a children’s pool, one for sports, a shallow one to lounge, and another with lanes for swimming laps. The total pool area is 9,300 square feet with capacity up to 481 people. They envision it to be open from 7 a.m. to 7 p.m. in warmer weather, about 108 days a year, and free if possible. When open, the pool could serve over 300,000 people every summer. Water in the East or Hudson rivers would flow directly into the pool, being filtered clean as it does, cleaning up to half a million gallons of water in the river a day. The cost of the project is expected to be $15 million, with a rollout slated for the summer of 2016. The project still needs a variety of permits, which they expect to get in 2015. Evan Erlebacher and Andre Guimond of Present Architecture took up the challenge of how to manage organic waste, and came up with a unique and sustainable concept of creating something beautiful with it. They call it the Green Loop, a mini-island of green. A public park would be constructed above a composting hub that would connect to the city like a pier. The project is in the conceptual stage at this point, but could kick-start more out-of-the-box ideas to address the city’s waste disposal problems. The city produces over 14 million tons of trash every year, which costs the city $300 million yearly in transportation alone. The city also has less public space per person than any other major city. The architects had reached out to community composting and recycling organizations, and environmental consultants to create the project. They envision a way to provide every borough with a composting station that takes advantage of the city’s transportation infrastructure. “It’s important that the design is not over-determined. In other words, you want to design public space in a way that’s somehow open-ended, allowing multiple uses from a wide variety of people who are all looking for different things,” Erelebacher said. It could be a neighborhood garden, provide skiing in the winter, or accommodate educational facilities, the architects said. “We believe that design should engage with cultural, technological, economic and ecological issues, and this frames our view of how architecture can be relevant,” Guimond said.